This book is supposed to convey the values of revising and editing one's work. Miss Doover has assigned her classroom the task of mastering the art of the 'thank you' note. As Jack writes and re-writes his thank you card to his fussy great-aunt Gertie, slowly the true story emerges... his unwanted gift of stationary turned out to be very useful when it served to mop up a mess left by his not-yet-housetrained puppy. 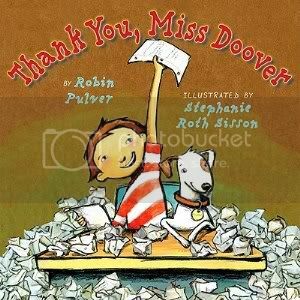 The story ends with a not-so-subtle nudge to the reader, pointing out "Miss Doover" is equivalent to "Miss Do Over." The book is appended with a humorous collection of 'correctly' worded, yet not polite thank you notes the other children in class have written. Discerning readers will doubtless be aware that the boy's original, simply worded note was actually far more effective than any of his later efforts - which I'm not entirely certain is the message that the author meant to convey. Attractive mixed media illustrations using colored pencils, acrylic paint and cardboard heighten the kid appeal of what is otherwise a somewhat didactic book.